I love it when people tweet things like “Thank you for reminding me why I work in this field.” More generally, I love helping to reconnect people with why they went into the field in the first place. I’ve never spoken to a convention of people in radiology before, but that’s why I work to understand each audience and deliver results on the first try. 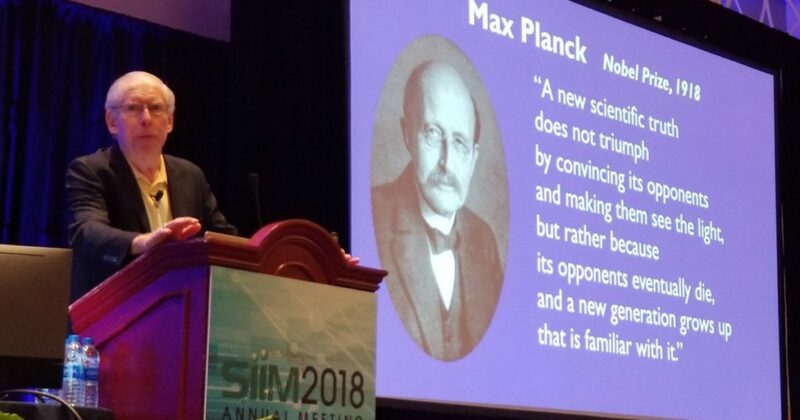 Mohannad Hussain @mohannadhussain · Thanks @ePatientDave for an absolutely amazing #SIIM18 opening session. Very inspiring! Lisa Danielpour @LisaDani · You are an impressive patient and family advocate, helping represent everyone’s voice! Stacy Norman @stacynormanguru · Favorite speaker of the day. Thank you, @ePatientDave! Lisa Spellman‏ @LisaASpellman Thank you @ePatientDave for another funny, compelling & important talk. Every time I hear you- I hear the voice of so many patients & it reminds me to keep pushing to drive positive outcomes. Rasu Shrestha MD MBA‏ @RasuShrestha Loved how @ePatientDave validated the inner geek in all of us attending #SIIM18 Geeks rule! Thank you to Paul, and Rick Wiggins, and everyone on his team involved in targeting this talk so well. I have a story where having my own X-rays DIDN’T help. 20 years ago I broke my hip while skiing in Canada. At the emergency clinic, they took X-rays and confirmed that I had broken the ball / head off the top of my femur. I was given the x-rays and some pain pills. The next day was driven back to the USA to see a specialist. I called my insurance company to get a referral and they told me two things: a) I had to wait 8-10 days for the referral to come in the mail (!) and b) I should go to an emergency room to get the x-rays re-done if I wanted to be seen before that. INSANE! Instead of doing either, I called around and got the name of an orthopedic surgeon and went to see him. He looked at the x-rays and did his own set (from the x-ray machine there in his office $$$$$), then wisked me into surgery that same day. No wonder our health care system is so radically expensive.